It’s past midnight and I’m up cleaning kitty puke. I am truly excited for the day when six cats can make artistic statements like that on my floor. Or maybe it’s dread I’m feeling. Or a hairball. 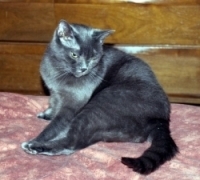 Ares, a gray cat with a crush on A and a nervous bladder. If she gets upset, she lets you know it. On yours pillow. Mars, a tuxedo cat who follows me around like a dog and willeat anything she can get in her mouth, whether it’s edible or not. Cole, a little white cat with black splotches who yells at everyone and likes to sleep beside me regardless of whether there’s room for her. Elmo, a large white cat who is deaf and takes showers. Gonzo, a tabby cat with intestinal issues that make him really skinny and sometimes stinky. Scooter, another tuxedo cat with an obsession for thick pink ribbons. A is an actor and so will be there for the fuzzy bunch more than I will. I have known him for 16 years although we only got our acts together and began dating recently. Neither of us were going to give our cats up so we decided that they would have to come with us as we took the next step in our relationship. And I am MisLin, a working stiff who is frequently awake at 1am to write blogs about her cats. I hope you enjoy this as much as I will!